NEW DELHI, NOVEMBER 27: West Bengal National University of Juridical Sciences (WBNUJS) Kolkata is to witness a change in its nature, if the WB State Legislative Assembly approves one of the bills tabled by its State Government. The tabled WBNUJS Amendment Bill proposes of increasing state-domiciled seats to as much as 30 per cent from the present cap of 8%. 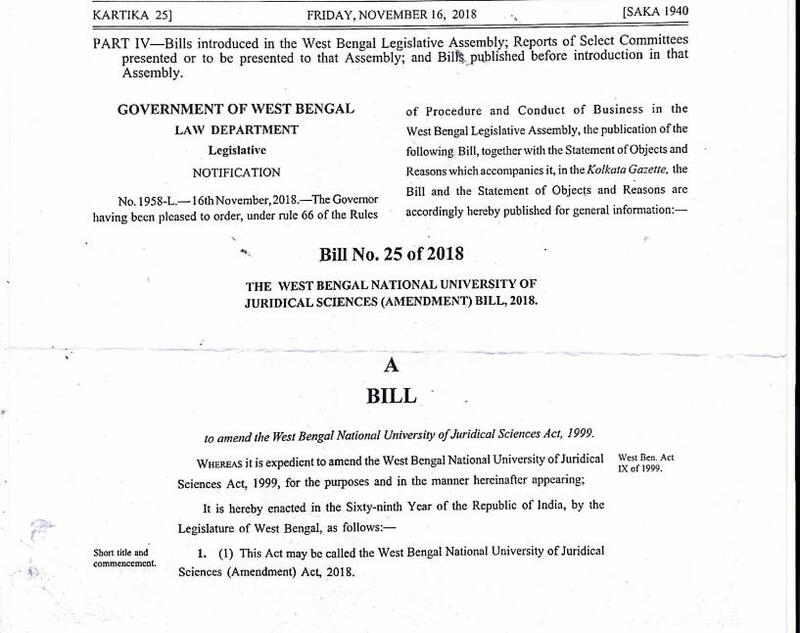 Further, the WBNUJS Amendment Bill if passed becomes an Act, will bring subjects like determination of tuition fees, reservation of seats as well as admission criteria under the purview of State Government, thus diluting the national-nature of the West Bengal NLU. After the 45-minute scheduled discussion in the State Assembly, the WBNUJS is yet to receive a decisive statement on the Bill. However, the Bill has never been opened for a public opinion, as the NLU faculty and students claimed that they were never a part of the discussion by the Executive Council of the NLU. Surprisingly, current WBNUS Vice Chancellor (Acting), Amit Talukdar as well as Dr Ishwar Bhat, the previous VC supported State Assembly in its plan to get a higher share, without opposing it, knowing that it might dilute the NLUs national-nature. Further, WBNUJS Executive Council also have West Bengal Law Minister, Moloy Ghatak and Judicial Secretary, Bibek Choudhuri, as their permanent members. If enacted, WBNUJS Amendment Bill may bring in some structural changes in the NLU. Tuition fees – The tuition fees in the NLU will be determined by the State Government and may be revised from time to time. Fees relaxation – The WBNUJS will compulsorily have to waive-off the tuition fees to at least five percent of the total strength of its admitted students belonging to weaker sections of the society including poor and economically backward classes. Criteria of fees relaxation – Referring the tuition fees waive-off of such candidates, the State Government will be the sole authority to determine the relevant criteria for recognising the poor and economically backward classes. Domicile seat reservation – The University in accordance with the State Government shall mandatorily reserve at least 30 per cent of the total intake for the state-domiciled candidates. Admission criteria – The admissions to the NLU will be based on the merit determined either on the basis of marks in the qualifying examination or the scores obtained in the law entrance test administered at national or state-level. Enactment – According to the State Assembly tabled WBNUJS Amendment Bill, 2018, if passed, the Act shall come into force at once, with no further delay. What next in WBNUJS Amendment Bill, 2018? The NLU’s EC is to meet on December 1, 2018 to shortlist the candidates who have applied to hold VC office chair. However, it seems before the NLU decides its upcoming VC, the State Government may come up with the new nature of WBNUJS, getting an undisputed share and say over the NLU. In addition to the structural changes the West Bengal NLU may have after the Bill is enacted, it may also decide on its own admission process and not through Common Law Admission Test, which is currently in place.